The McDonnell Douglas X-36 Tailless Fighter Agility Research Aircraft was a subscale prototype jet designed to fly without the traditional tail surfaces used on most aircraft. The X-36 was built to 28% scale of a possible fighter aircraft, and controlled by a pilot in a ground station virtual cockpit with a view provided by a video camera mounted in the nose of the aircraft. For control, a canard forward of the wing was used as well as split ailerons and an advanced thrust vectoring nozzle for directional control. The X-36 was unstable in both pitch and yaw axes, so an advanced digital fly-by-wire control system was put in place to stabilize the aircraft. First flown on May 17, 1997, it made 31 successful research flights. It handled very well, and the program is reported to have met or exceeded all project goals. McDonnell Douglas merged with Boeing in August 1997 while the test program was in progress. So the aircraft is sometimes referred to as the Boeing X-36. The X-36 possessed high maneuverability that would be ideal for use as a fighter. 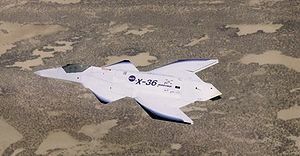 Despite the potential suitability, there have been no reports regarding the X-36's development as a fighter as of 2010. One X-36 is at the National Museum of the United States Air Force at Wright-Patterson Air Force Base near Dayton, Ohio. It arrived on July 16, 2003, the same day as the Boeing Bird of Prey. It is displayed in the Museum's Research & Development Gallery. Jenkins, Dennis R., Tony Landis, and Jay Miller. SP-2003-4531, "American X-Vehicles, An Inventory-X-1 to X-50". NASA, June 2003.